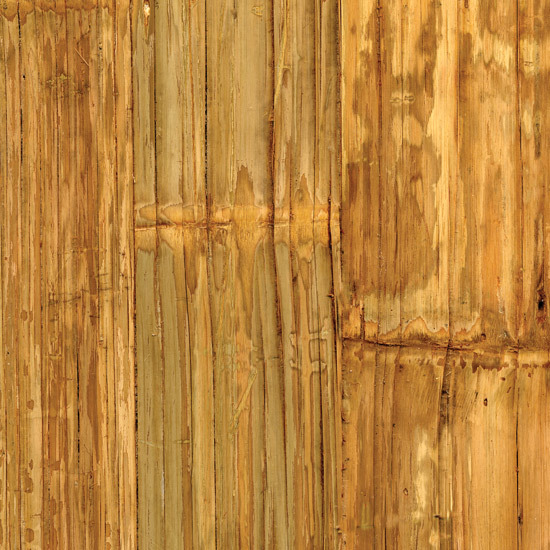 Decorative Materials: Double Sided Bamboo Board 4′ x 8′ sheet of 1/2″ Plywood covered with splayed and crushed bamboo on both sides. Very rustic textured surface. The double sided finish makes this material ideal for bar facades where the material will be seen from both the interior AN exterior of the bar. In the event that only one face of the product can be seen, Safari does offer a single sided version. Appearance: 4′ x 8′ sheet of plywood covered with rustic bamboo that has been splayed open and glued as well as pin-nailed to the plywood. Fire Protection: Can be treated for fire retardancy. This treatment most often requires additional lead time. Talk to you sales rep for more details. Ease of Installation: As per typical plywood installation. Nail, Staple or Screw. Take care when cutting, and use eye protection at all times, as the pin nails can be a hazard.